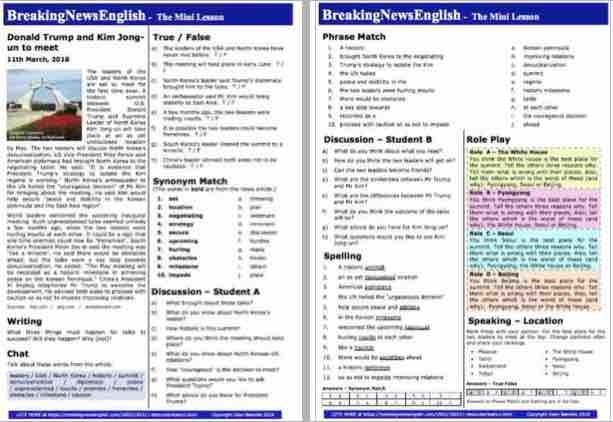 Try easier levels of this lesson: Denuclearization - Level 4 or Denuclearization - Level 5. The leaders of the USA and North Korea are set to meet for the first time ever. A historic summit between U.S. President Donald Trump and Supreme Leader of North Korea Kim Jong-un will take place at an as yet undisclosed location by May. The two leaders will discuss North Korea's denuclearization. US Vice-President Mike Pence said American diplomacy had brought North Korea to the negotiating table. He said: "It is evidence that President Trump's strategy to isolate the Kim regime is working." North Korea's ambassador to the UN hailed the "courageous decision" of Mr Kim for bringing about the meeting. He said Kim would help secure "peace and stability in the Korean peninsula and the East Asia region". World leaders welcomed the upcoming inaugural meeting. Such unprecedented talks seemed unlikely a few months ago, when the two leaders were hurling insults at each other. It could be a sign that one-time enemies could now be "frenemies". South Korea's President Moon Jae-in said the meeting was "like a miracle". He said there would be obstacles ahead, but the talks were a key step towards denuclearization. He added: "The May meeting will be recorded as a historic milestone in achieving peace on the Korean Peninsula." China's President Xi Jinping telephoned Mr Trump to welcome the development. He advised both sides to proceed with caution so as not to impede improving relations.